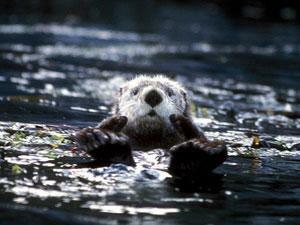 Should Sea Otters Count for Carbon Credits? Should we be rewarded for shooting ourselves in the foot and then backtracking? Apparently so, at least when it comes to carbon credits. Sea otters, a species that almost went extinct due to fur hunting in the 18th and 19th centuries, could be worth over $700 million in carbon credits if they are restored to healthy populations, according to New Scientist. The recent decline in the sea otter population admittedly has little to do with humans–the growing killer whale population is thought to be a major contributor to the population decline from 125,000 sea otters in the 1970s to approximately 70,000 today. But humans were responsible for cutting down the population originally, and now we need help from the cuddly-looking animals: A healthy sea otter population in North America could potentially sequester 1010 kg of carbon. That’s because sea otters eat sea urchins, which in turn gobble down carbon-sequestering kelp. Fewer sea urchins means more kelp is available to lock up carbon. While it technically makes sense to award carbon credits to sea otter preservation initiatives, there’s something a little suspect about patting ourselves on the back for bringing a species we almost destroyed back from the brink. And the carbon trading market has enough trouble establishing credibility without bringing animal conservation into the mix. The whole thing is reminiscent of Dr. Pepper’s recent “Made With Real Sugar” campaign, which features special “throwback” versions of Mountain Dew and Dr. Pepper that are sweetened with sugar instead of corn syrup. But again, Dr. Pepper is trying to get us excited about the novelty of an ingredient that should have been there in the first place. Maybe it’s a stretch to compare sea otters and sugar, but we’re a bit tired of seeing a return to the status quo lauded as real change.